Health Promotion in Practice is a practice-driven text that translates theories of health promotion into a step-by-step clinical approach for engaging with clients. The book covers the theoretical frameworks of health promotion, clinical approaches to the eleven healthy behaviors—eating well, physical activity, sexual health, oral health, smoking cessation, substance safety, injury prevention, violence prevention, disaster preparedness, organizational wellness, and enhancing development—as well as critical factors shaping the present and the future of the field. Written by the leading practitioners and researchers in the field of health promotion, Health Promotion in Practice is a key text and reference for students, faculty, researchers, and practitioners. "Finally, a signature book in which practitioners of health promotion will find relevant guidance for their work. Sherri Sheinfeld Gorin and Joan Arnold have compiled an outstanding cast of savvy experts whose collective effort has resulted in a stunning breadth of coverage. Whether you are a practitioner or a student preparing for practice, this book will help you to bridge the gap between theory and practice-driven empiricism." "The models of health promotion around which Health Promotion in Practice is built have a sound basis in current understanding of human development, the impact of community and social systems, and stages of growth, development, and aging. This handbook can provide both experienced health professionals and students beginning to develop practice patterns the content and structure to interactions that are truly promoting of health." Sherri Sheinfeld Gorin, Ph.D., is associate professor at Columbia University, Teachers College, and senior member, Herbert Irving Comprehensive Cancer Center, New York, N.Y., and director, New York Physicians Against Cancer (NYPAC). Joan Arnold, Ph.D., R.N., is professor of nursing, The College of New Rochelle School of Nursing, and serves as a consultant to the New York State Center for Sudden Infant Death, New York City Satellite Office/MHRA. PART ONE: HEALTH, HEALTH PROMOTION, AND THE HEALTH CARE PROFESSIONAL. 1. Images of Health (Joan Arnold, Laurel Janssen Breen). 2. Models of Health Promotion (Sherri Sheinfeld Gorin). 3. 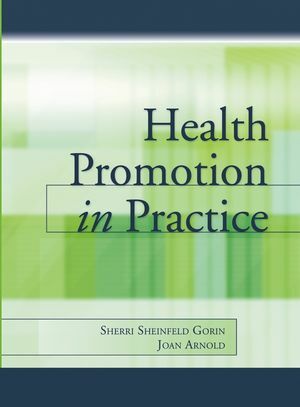 Contexts for Health Promotion (Aaron P. Gorin, Sherri Sheinfeld Gorin). 4. Agents for Health Promotion (Laurel Janssen Breen, Joan Arnold). PART TWO: PRACTICE FRAMEWORKS FOR HEALTH PROMOTION. 5. Eating Well (Lorraine E. Matthews). 6. Physical Activity (Karen J. Calfas, Athena S. Hagler). 7. Sexual Health (Theo Sandfort). 8. Oral Health (Joan I. Gluch, Susanne K. Giorgio, Barbara J. Steinberg). 9. Smoking Cessation (Sherri Sheinfeld Gorin, Robert A. Schnoll). 10. Substance Safety (Kristen Lawton Barry, Frederic C. Blow). 11. Injury Prevention (David A. Sleet, Andrea Carlson Gielen). 12. Violence Prevention (Lloyd B. Potter). Prologue (Sandro Galea, Craig Hadley). Disaster Preparedness (Stephen S. Morse). 14. Organizational Wellness (Thomas Diamante, Samuel M. Natale, Manuel London). 15. Enhancing Development (Penelope Buschman Gemma, Joan Arnold). PART THREE: ECONOMIC APPLICATIONS AND FORECASTING THE FUTURE OF HEALTH PROMOTION. 16. Economic Considerations in Health Promotion (Wendy Dahar, Duncan Neuhauser). 17. Future Directions for Health Promotion (Sherri Sheinfeld Gorin).